Ever walked into a home for sale that is full of someone else’s “stuff”? The home will feel cluttered and not terribly appealing. 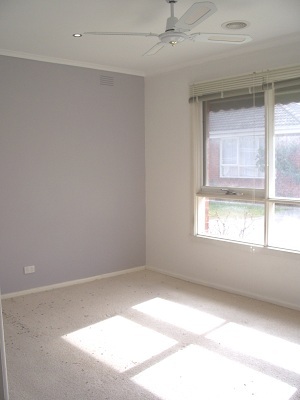 Alternatively, the owners have moved out and the house is totally bare – not a stick of furniture to be seen. Compare the above to a home that has been beautifully prepared for sale with care and attention paid to even the tiniest detail. Cupboards are sorted. Clutter has been removed. The home will feel welcoming and inviting to a potential buyer. Staging a home means dressing your home for open for inspections. From arranging flowers in an attractive vase to the effective use of scatter cushions on a couch to the correct placement of furniture to open up a room, staging your home for sale can literally add thousands to the price a potential purchaser will pay. 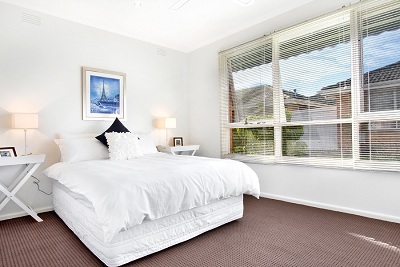 Here’s an example of an unfurnished bedroom and then what the room looked like once it had been staged. Two totally different looks and feel to the room. When looking for a home, a buyer needs to be able to visualize the space and imagine what it would be like to live there themselves. Through the clever use of furniture, you can paint the picture in your buyer’s mind of how their own furniture will look and feel in the space. You want them to start to imagine living there. Remove unnecessary items that will fill the space and make it look too “busy”. Family picture frames, excess books and knick knacks on shelves, shoes scattered across the bedroom floor, children’s toys not put away – all these things will be noticed and interrupt the flow of a room. Either put them away or remove them all together. Tidy, tidy, tidy, even inside drawers and wardrobes. Then tidy and clean some more. Trust me, buyers will open doors and look inside anything you have in your home. From the bedroom to the bathroom to the kitchen, make sure everything is organized, clean, neat and tidy. Before you begin your sales preparation, visit other homes for sale in your area to get a feel for how others are presenting their homes. This will also give you a benchmark to match or, preferably, beat. If you need a hand with staging your home, we can help. Talk to us about getting your home staged here. What are you thoughts on presenting a home for sale. Do you think you need to stage a home? Leave your thoughts in the comments below. Next post: Common Homeseller Mistakes: Is your home ready to open for inspection?